This year, the USAPA National Championships will be held in Indian Wells located just outside of Palm Springs, California. The facility is home to the BNP Paribas Open – the largest combined men and women’s tennis tournament in the world. IWTG features the second largest tennis stadium in the world – an impressive 16,100-seat Stadium 1 – as well as a permanent 8,000-seat Stadium 2. The venue also boasts 28 world class courts and will soon be adding championship pickleball courts to the site. The sport of pickleball, often described as a hybrid of tennis, badminton and ping pong, is much more than a game. It’s a way of life for a community that continues to grow exponentially, thanks to its appeal with players from the young to the young-at-heart. Played on a badminton-sized court with the net set to 34 inches high at the center, players volley a perforated plastic ball similar to a wiffle ball with a composite paddle about twice the size of a ping pong paddle. Pickleball can be played indoors or outdoors as singles or doubles. The game has a passionate following due to its friendly, social nature and multi-generational appeal. Open Registration: Staggered registration was offered on Aug. 1, 2018. Click here for a registration update as of Aug. 2. Participate in a minimum of one USAPA Sanctioned Tournament between November 15, 2017, and October 31, 2018, or participate in a USAPA Regional Tournament between July 15, 2017, and October 31, 2018. Open event entrants must have a minimum of a 5.0 USAPA Rating by July 31, 2018. Events may open up to 4.5 USAPA rated players, depending on participation levels in each event. Announcement: Revised Event Structure for 2018. Click Here to Read Details. 8-12, 13-15, 16-18- may be adjusted based on participation. 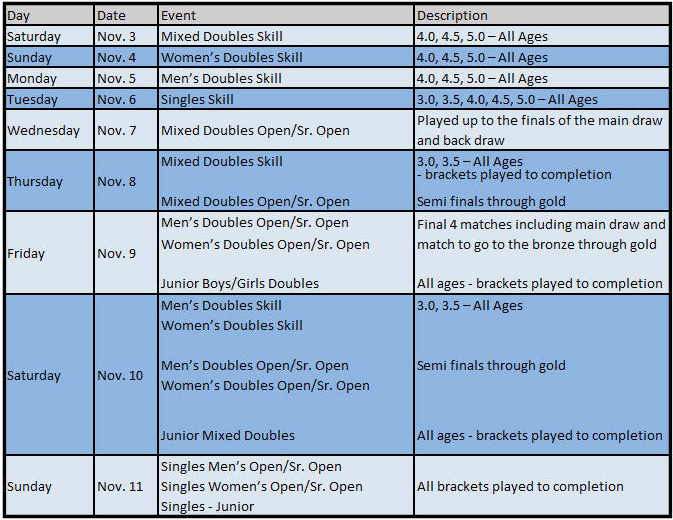 *Junior divisions are open to any junior that is interested in participating, no participation requirements. *Juniors may opt to play in the Open Events but must meet the participation requirements. May not mix and match Open/Junior Events. *Juniors may participate in under 35 Skill/Age Events if participation requirements are met. High quality, above ground semi-permanent nets designed specifically for this event. Visit the website for complete details on registration, schedule and FAQs.